An earthquake with a magnitude of 5.8 on the Richter scale hit the Canadian Arctic Archipelago on January 8, 2017. Above image was created with USGS (United States Geological Survey) content. The image shows the epicenter of the quake (gold star). The earthquake hit Barrow Strait on January 8, 2017 at 23:47:12 (UTC), at 74.320°N - 92.305°W and at a depth of 18.9 km. Another earthquake hit Barrow Strait on January 9, 2017, this time with a magnitude of 5.2 on the Richter scale, within a day of the earlier M5.8 quake (both in orange on map below). These two earthquakes are among the largest quakes to hit the area in the past five years (map area shows all M1+ quakes since January 9, 2012). These earthquakes are important, given their magnitude and given that they hit an area without large faultlines (though earthquakes are not uncommon here, also see this discussion). 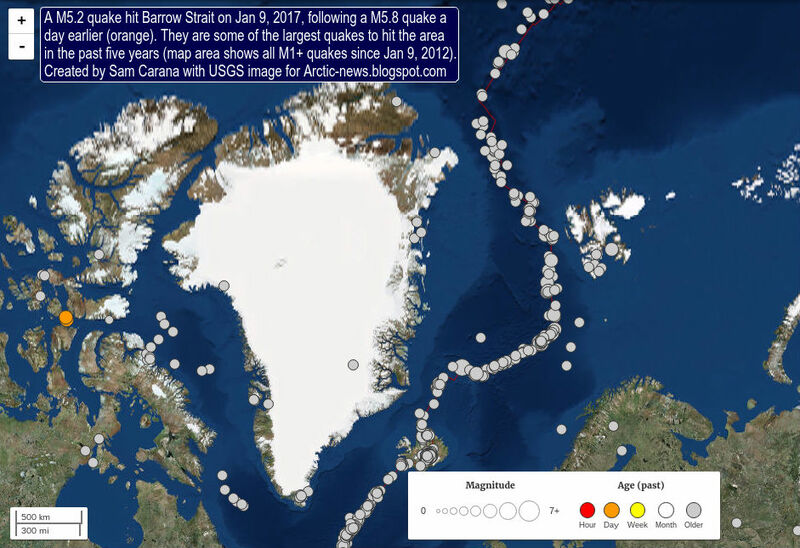 Importantly, these earthquakes occurred in an area prone to glacial isostatic adjustment, as illustrated by the image below. Glacial isostatic adjustment as a phenomenon typically takes place over relatively long periods. Yet, extreme weather events can trigger earthquakes in areas that are already on the edge. The extreme weather situation is depicted by the combination image below. Similar to the M4.6 earthquake that hit Baffin Island on February 12, 2015, this earthquake occurred at a time when surface temperature anomalies over parts of North America and Greenland were at the bottom end of the scale. At the same time, temperature anomalies over the Arctic Ocean are at the top end of the scale, as illustrated by the left panel in above image. The right panel in above image shows pressure differences reaching the top and bottom ends of the scale. 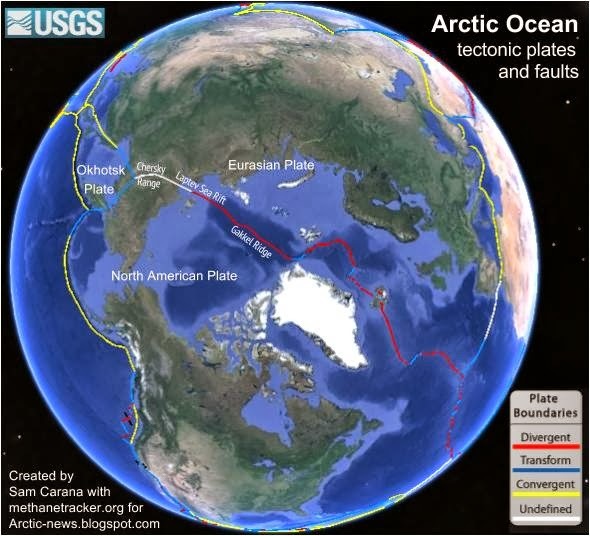 Earthquakes in the Arctic Ocean are dangerous as they can destabilize methane hydrates. Huge amounts of methane are present in sediments under the Arctic Ocean in the form of free gas and hydrates. Earthquakes can send out strong tremors through the sediment and shockwaves through the water, which can trigger further earthquakes, landslides and destabilization of methane hydrates. The situation is especially dangerous when combined with extreme weather events that can cause cracks and movement in sediments. Above map, from an earlier post, shows the location of fault lines on the Northern Hemisphere. The combination image below shows methane levels on January 9, 2017, am, at two different altitudes. As temperatures in the Arctic Ocean keep rising, the jet streams and polar vortex are changing their shapes. The North Polar Jet Stream becomes more wavy, and this makes that more extreme weather events can happen such as the events described above. Earthquakes involve a snap loss of material strength friction and movement and I think there is a parallel loss of composure in the field of politics right now as Earth Extincting lock out ambles toward columns Trump-Russia. Certainly the temps and pressures exert force unbearable in proximity end. This quake has me intrigued. I checked the seismograph network in my area this morning (Kansas) and here's this quake showing like it was a 6.0+ magnitude quake within 1,000 miles. I've never seen a < 6.0 show up like this from such a long distance. Well, with Earth going one way and the world going basically the exact opposite direction, God knows what's going to happen.. Still the advent of internet communications and industrial capacity still up says the world better snap accounting error Correction Real into place and work like our lives depend on in earnest. I detected both of the January Parry Channel quakes (near Cornwallis Island/Resolute) from Cotter Arkansas using a homemade seismometer that runs 24/7 in my basement. Granted, it is a very sensitive instrument owing partly to the use of a Fourier transform type of data processing method. I also detected the much more recent (February 10, 2017) quake, and although it was supposedly weaker than those first two (mag. ~5.3), it recorded stronger! Not only that, but the whole quake from beginning to end (about 20 minutes total duration, 5 minutes of which produced the strongest impulses) was dominated by 1 Hz seismic energy. My expertise is chemistry, not seismology (I was a professor of chemistry), but I have read that extended quakes that produce specific frequencies are called "harmonic tremors, and they are associated with volcanic activity. Please don't take my word for it, and I'm not claiming that it actually was volcanic, because volcanic activity might not be the only route to such phenomena. It just doesn't look like any quake that I've seen thus far, and the Fourier transform method clearly shows that 1 Hz seismic energy dominated this quake from beginning to end. I have trouble believing that these Parry Channel events were glacial isostatic adjustments, because such quakes produce ordinary-looking seismograms. We see isostatic events in nearby Bull Shoals Lake (mag 1 to 2) when the reservoir goes high or low (when stresses on the bedrock increase or decrease). Robert W (above) is right to say that there was something unusual about this series of Arctic quakes.